Joy Creek Photo Archive (c) all rights reserved Saxifraga 'Cockscomb' is one of the encrusted saxifrages that is derived from S. paniculata. Lime encrustations line the margins of the upper half of the convex leaves and also are prominent in the center of this outlined area. Individual rosettes measure one-and-a-half to two inches in width. New off-sets have attractive burgundy red stems. 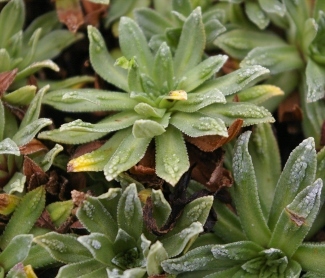 This is fairly easy to raise in a well-draining rockery or container. Early summer. 1 in. x 4-6 in.